I will only plant plants adapted to my conditions. In other words, put the right plant in the right place. If your garden is shady, plant only shade-tolerant plants. If the soil is always on the dry side, grow varieties that can take drought. If you know that your soil is very acidic, limit yourself to plants that tolerate acid soil. In areas with cold winters, take hardiness zones into consideration and plant only those plants adapted to your hardiness zone or lower ones (for example, if you live in zone 5, grow only plants adapted to zones 1, 2, 3, 4 or 5). Much of this information is very clearly noted on the label the plant bears in the nursery, so read it well before buying! I will leave grass clippings on the lawn. I will remove plants that always have something wrong with them. Some plants are attacked by pests or diseases year after year, so you end up treating them with pesticides to prevent the symptoms. That isn’t good for the environment and in fact, is often not good for your own health (there is always a risk involved in applying a pesticide, even an organic one). Just pull up such plants (hostas with slug damage, lilies devoured by scarlet lily beetles, phlox covered in powdery mildew, apple trees with scab-mottled leaves and fruit, etc.) and replace them with plants that have no such enemies. And believe it or not, there are hostas that are not eaten by slugs, phlox that are not attacked by mildew and apple trees that don’t suffer from scab. As for the lilies, the news is not so good: they are all subject to the lily beetles. Perhaps you could replace them with daylilies, which have similar flowers, but fewer health problems. I will stop pruning for strictly aesthetic reasons. Deadheading lilacs or pruning shrubs into balls, squares or spirals is a good way to waste energy for nothing. Deadheading lilacs (that is, removing their faded flowers) is not helpful in any way (despite a tenacious belief that says it will increase the number of flowers the following year, that simply isn’t true). The only real accomplishement is to remove the drying seed capsules that are kind of on the ordinary side. Surely you can learn to live with them? And the majority of shrubs naturally take a beautiful shape that is all their own: why force them to take on an imposed form? I will check the future dimensions of any plant before buying it. Most pruning is done to reduce the size of shrubs and trees that have become too big for the available space. Yet, as soon as you finish pruning, they will quickly grow back, so you have to prune them again and again. It’s so much easier to check the future dimensions of any plant, especially a woody one (tree, shrub or conifer), before you buy it … and to choose only ones that fit the space you have. I will stop using winter protection on my plants. This has become a major fall task for many gardeners … and then they have to remove their plants’ winter covering in the spring, doubling the work. And yet there are many plants that will grow and bloom perfectly without being wrapped up like a mummy in the fall. And as for any plants that do die or behave badly when you don’t protect them, they simply don’t deserve a spot in your laidback garden! Replace them with plants that don’t need winter protection. Imagine the difference in effort that will result! I will stop planting invasive plants. I will stop doing fall cleanup. Sure, do rake or blow excess fall leaves off your lawn into flower beds, but there is no need cut back the plants in the bed itself, even though so many gardeners do this religiously each fall. They’ve been taught it’s good for their plants … but it isn’t. Perennials cling to their stems and leaves, even when dead, as protection from cold, drying winds and as a natural mulch to moderate winter soil temperatures. By cutting them back, your plants will be in worse shape in the spring than if you left them alone. Also, a plant’s own dead leaves and stems are supposed to be its primary sources of minerals. In fact, the best fertilizer for any plant is its own decomposing foliage! You’ll find that most of the “dead vegetation” left on a flower bed (or vegetable bed) actually decomposes during the winter and spring. When the snow melts, you will discover that there is almost no cleaning to do. Besides, what little “litter” is left will soon be covered with fresh foliage! I will avoid monocultures wherever possible. Mass planting of the same plant—whether it is a lawn made up entirely of Kentucky bluegrass or zoysia, dense rows of potatoes in the vegetable garden or an endless carpet of the same groundcover—is an open invitation to insects and disease and that forces you to carry out treatments that are often expensive or, at the very least, take up a lot of your time. In addition, monocultures of the same plant repeated year after year deplete the soil, forcing you to add fertilizer. Plant instead by blending plants together: a mixed flower bed, for example, or a square foot vegetable garden with varied interplantings, will easily reduce pesticide treatments, because there will be little or no insect or disease problems. And there will be almost no need to fertilize. As for lawns … there is no law that says they must consist of only one variety of grass. Simply adding 15% of clover to a monoculture lawn will quickly eliminate a lot of its insect problems, for example. And if other plants move into the lawn, why not let them grow there? The more varied the lawn is, the less maintenance it will require. I will read the Lazy Gardener blogs throughout the New Year. 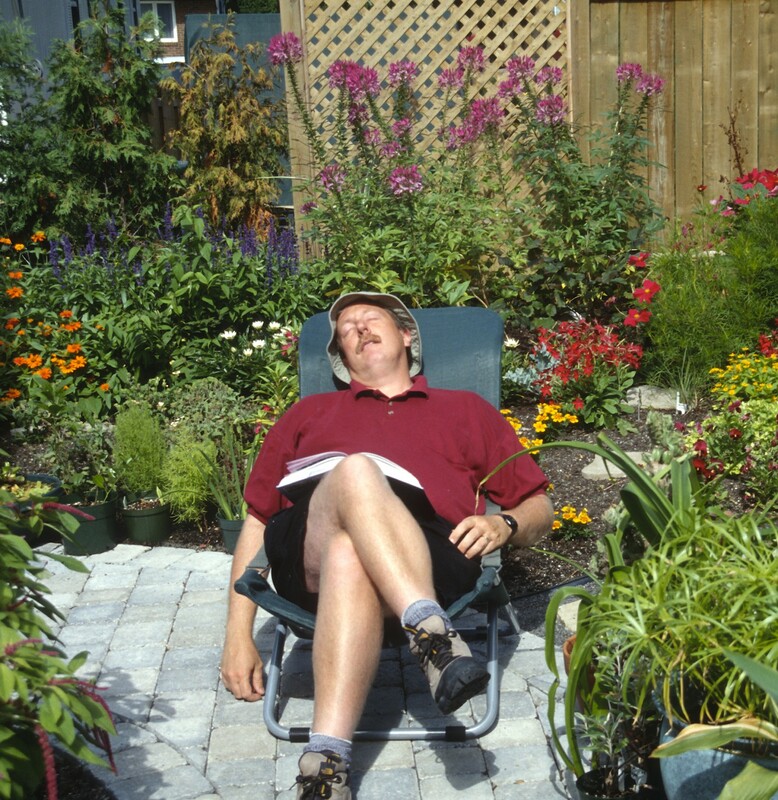 After all, what better way to keep you informed on the best ways to be a laidback gardener! And there is one blog a day, enough to give you a little reading to start every day!